WASHINGTON (CNNfn) - Federal Reserve Chairman Alan Greenspan gave his broadest endorsement of tax cuts to date Thursday, while also indicating that the U.S. economy has slowed dramatically, raising investors' hopes that further interest rate reductions are on the horizon. In testimony to the Senate Budget Committee, Greenspan declined to comment on President Bush's $1.6 trillion, 10-year tax cut plan, saying a decision on the size of a cut was best left up to Congress and the political process. But the Fed chairman's backing of tax cuts as economically sound likely will provide a boost to the new administration's proposals. The Fed chairman did not specifically discuss interest rates. But Greenspan did say that the slowing economy is close to stalling. Greenspan said, however, that there was only a low risk of recession. "It is a low probability. Recessions are low probability, they are rare and they happen for numbers of different reasons," he said, responding to a lawmaker's question. Wall Street is awaiting a meeting of Fed policy makers next week, the committee's first meeting since a surprise half-point interest rate cut Jan. 3. Buoyed by Greenspan's comments, the Dow Jones industrial average rallied sharply Thursday afternoon, gaining nearly 120 points to 10,764. The technology-heavy Nasdaq exchange lost ground, however, amid a cautious revenue outlook from fiber-optics maker Corning. Most economists predict Fed policy makers will cut interest rates again at the Jan. 30-31 meeting. But analysts said it was impossible to tell by how much � and that Greenspan isn't giving many clues. "I think that it's very hard to tell from what he said what they will do next week in terms of size," said Carol Stone, deputy chief economist at Nomura Securities in New York. "His emphasis on the fact that there is almost no growth now suggests that they might move, but it doesn't tell us how much." Stone, like several other Wall Street economists, predicts another half-point interest rate cut next week. Anthony Chan, an economist at Banc One Investment Advisors, also said it is possible the Fed will cut rates by that much, but said Greenspan's remarks also suggest that the Fed chairman is not in a panic that the economy is on the verge of recession. Observers say Greenspan's comments mark a slight shift in his stance on tax cuts. The Fed chief had long been a proponent of using budget surpluses to pay down the national debt first, instead of using additional revenue to pay for tax reduction. 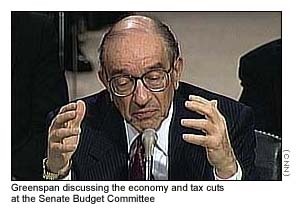 Watch part of Greenspan's testimony on tax cuts before the Senate Budget Committee. But Greenspan said government estimates project more than enough surplus funds to pay off the debt and reduce taxes too. These projections have convinced him that it is sound to proceed with a tax cut now, said Douglas Lee, president of Economics from Washington, an economics consulting firm. "What he did change is his views on the timing of the issue," Lee said. "He made it very clear that the changes that have occurred over the past year have made it much more likely that we would pay off the national debt much sooner." But Greenspan made clear that he does not view tax cuts as a way to jumpstart the economy. He said monetary policy, which governs interest rates, is a more effective tool than fiscal policy in fighting recession, noting that fiscal moves take a long time to take hold and face hurdles, such as the timing of Congressional approval. "We cannot expect tax cuts to do all that much because cycles in this country have usually been characterized by fairly long expansions and then sharp contractions -- contractions which, I might add, are very difficult to forecast," he said. "Monetary policy can work almost instantaneously." Greenspan said that if it became clear that politicians might be tempted to use the money for major spending initiatives, it would be better to cut taxes. "It is far better, in my judgment, that the surpluses be lowered by tax reductions than by spending increases," the Fed chairman said.